Where do I begin to list all the things that are right with Kung Fu Panda? Is it the wonderful animation that is as close to Pixar quality as I’ve yet seen from the DreamWorks roster? Is it the wonderfully snappy script that manages to be sweet and heartwarming, yet hilarious and clever enough for all ages? Is it the amazing action, more thrilling than in any other animated film allegedly aimed for the kiddies? Is it the top-notch voice acting that brings out fantastic performances from some of Hollywood’s most famous stars? Yeah, that’s nearly all of it, but there’s still much more. Let’s get to it. Po the panda is dreaming vivid primary-coloured tales of a heroic martial arts master. This hero performs amazing feats of kung fu alongside the Furious Five, an elite team of fighters who live and train in the Jade Palace, a temple perched high above Po’s village. The master in Po’s dream would be himself, naturally, but the trouble is when Po awakens, he’s still just a cook in his loving father’s noodle restaurant. When a prophecy reveals a danger to the town and temple, the entire populace gathers to crown a new Dragon Master who will save them all from the scourge of the evil Tai Lung, a vengeful snow leopard who was once a student in the Jade Palace. Through a series of slapstick coincidences, Po literally falls from the sky into the path of the wise old turtle Oogway, the ancient master who invented kung fu. 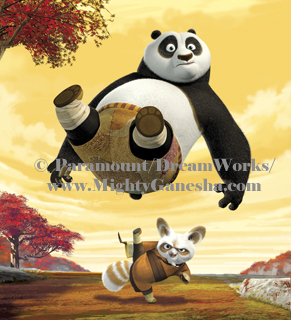 Kung Fu Panda reminds us often that “there are no accidents,” and Po is chosen as the town’s savior, much to the chagrin of Master Shifu, the Furious Five and the village citizens, who cannot accept this overweight, untrained panda as the one who will rescue them from the menace of Tai Lung. Once inside the Jade Palace, Master Shifu makes it his mission to exhaust and humiliate Po into quitting, but the good-natured panda is far too impressed living amongst his idols to conceive that he is unwanted. 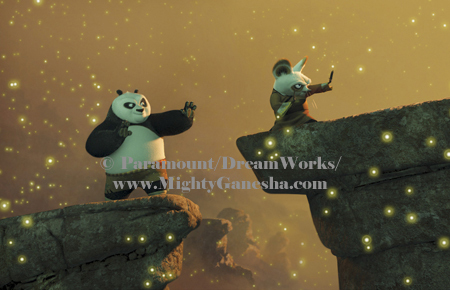 As the peril of Tai Lung draws closer, Master Shifu realises he has no choice but to have faith in the new Dragon Master and that it is his job to find Po’s gift and train him to defeat Tai Lung. 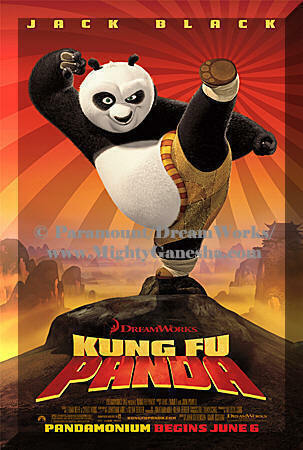 The most standout thing about Kung Fu Panda is what a great martial arts film it is. No, really. Yes, it’s a cartoon and stars a lot of cute, highly-merchandisable animated creatures, but the amount of genuine kung fu movie love that permeates the film is palpable and shines through to anyone who is a fan of the genre. Tai Lung’s escape from prison and his fights against the Furious Five and Master Shifu are as beautifully choreographed as if they had been devised by the great martial arts icon, Yuen Woo-Ping. So much detail and many frames are devoted to giving these sequences a frenetic realism and power. 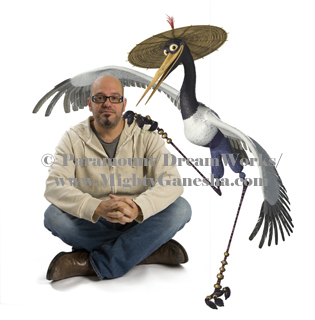 The animators are careful to portray each of the animals of the Furious Five battling in their own particular style, Tigress, Mantis, Crane, Snake and Monkey. The teamwork amongst the Five in their big throwdown with Tai Lung is wonderful to watch. Hans Zimmer’s rousing Asian-inflected score heightens the thrills with well-placed percussion. As in any good martial arts film, the violence of the fights is beautiful, gripping, blindingly-paced and exciting. I’m glad the folks at DreamWorks realised that movie-going kids these days can take a little punchy-kicky that is done well. I can picture the queues of parents registering their little ones for Tiger Schulman’s after opening weekend. The animation is excellent and DreamWorks has done some great cross-pollination of styles. The film’s opening sequence is straight out of Samurai Jack with stark, sharp lines and rich colour washes. There is the occasional Anime moment (- As in Horton Hears a Who, the chubby main character plays fast and loose with Dragonball Z’s iconic Kamehameha move), which is a great connection to young viewers. The rest of the film is excellent Pixar-quality CGI with majestic background landscapes that look like a Chinese fairy tale come to cinematic life. The clouds surrounding the temple cliffs, delicate peach blossoms floating through the air, the beautiful Jade Palace interiors, the endless depths of Tai Lung’s cold purgatory-like prison and the movement of the snow leopard’s fur as a breeze blows through it are painstakingly rendered. No detail is lost. The fine artistic quality even extends to the ending credits, a gallery of character paintings roll by in beautiful red, sepia and gold tones (- Besides seeing the pretty pieces, you might want to hang around till after the credits, anyway…) . The script is genuinely funny and sweetly sensitive. Po’s exchange with the nonplussed Crane whose bedroom he’s invaded is a hoot. The portly panda’s verbal and physical back and forth with Master Shifu is crackling and hilarious. Happily, there’s precious little gross-out humour to be found (- I’m sure DreamWorks, the studio that gave us Shrek was sorely tempted). Touching moments such as Po finally revealing to his father (- a goose) that life in the noodle shop is just not what he dreams of is tinged with enough humour so as not to be mushy, but the scenes retracing Master Shifu’s loss of his most beloved student, Tai Lung, is moving and sad. The film’s lessons in courage, believing in oneself and the value of friends and family are certainly worthy homilies to impress upon both the kiddies and their parents. 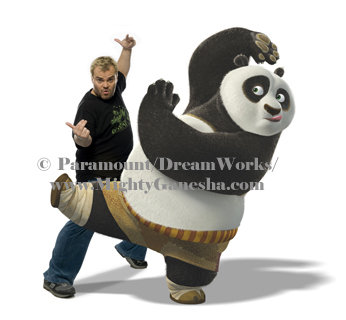 For anyone growing bored with his same hyperactive Tenacious D persona/shtick over and over again, Kung Fu Panda verifies that the key to a great Jack Black performance is channeling. What registers as tiresome in real life works wonders behind a 260-pound animated panda. Black’s performance as Po blends him into his CGI alter-ego and tamps down the louder instincts until they’re really needed. Dustin Hoffman’s well known inflections are nicely transformed behind the poised, distinguished Master Shifu. Ian McShane is cast to perfection as the vengeful snow leopard, Tai Lung. McShane’s rich, roaring tones easily convey the sentiment of the flashback scenes when he was a wide-eyed ambitious young student and easily conveying the rage of the villain Tai Lung has become. The fierce leader of the Furious Five is Tigress, whose own emotional losses have made her cold and aloof. Angelina Jolie’s voice compliments Tigress’ strength and carefully hidden vulnerability. David Cross’s bemused, droll Crane is a hoot, and Lucy Liu finally gets a good role in a feature film as the voice of the sweet, caring Snake. 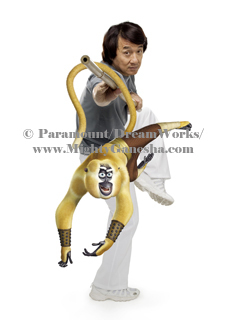 To further the nod to authenticity, the Five’s Monkey is voiced sparingly by the one and only Jackie Chan. I even spotted some of Jackie’s moves in Monkey’s fighting repertoire. Kids, this is just great fun. There is something for everyone in Kung Fu Panda and all absolutely worth seeing on the big screen. It’s a supremely entertaining example of how very far animated films have come in not only their technology, but in being able to believably involve all of us in their story. PS: E & C, you’re almost forgiven.